The Zukor Media Player provides clinicians the ultimate choice, flexibility and features for using all types of media for patient feedback training. The Zukor Media Player can handle video, audio and still images in all common file formats and also directly from DVDs and CDs. It also has a built-in fractal generator and kaleidoscope. And, as an upgrade feature, YouTube videos can be used. 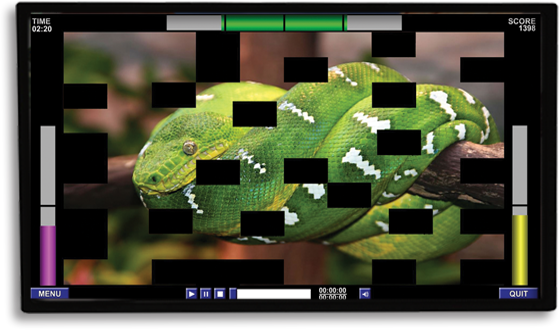 The Zukor Media Player offers more than 25 types of high-quality feedback, from simple Play/Pause, Volume Up/Down, Pixelate and Zoom Out to more visually striking, such as Bubbles, Double Vision, Snow and Vortex. The Zukor Media Player allows the clinician to use from 1 to 16 events to drive an equal number of visual effects or audio feedback sounds. It works with all modalities of neurofeedback and biofeedback, including Z-Score. Free Support! Free Training! Free updates!